Images and text by Lindsey Johnson. Cooking outdoors is something I love doing, but I know it can be intimidating. So I thought it would be helpful (and fun!) 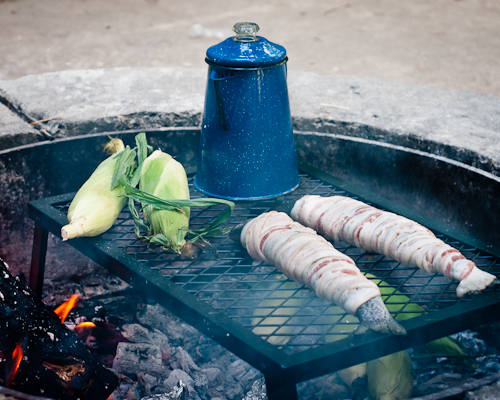 to create a three part series on different ways to cook outdoors. I think you’ll really like this mini-series! For the first post, I wanted to talk about campfire cooking because it’s definitely one of my favorite things about summer and being outdoors. Let’s get to it! There is definitely something deeply satisfying about cooking over an open fire. The flavors, the smells, the sounds. All of it conjures up good memories of childhood camping trips and communing with nature. Campfire cooking can be just as fun and satisfying whether it’s for a week at a campground or for the day in your own backyard. 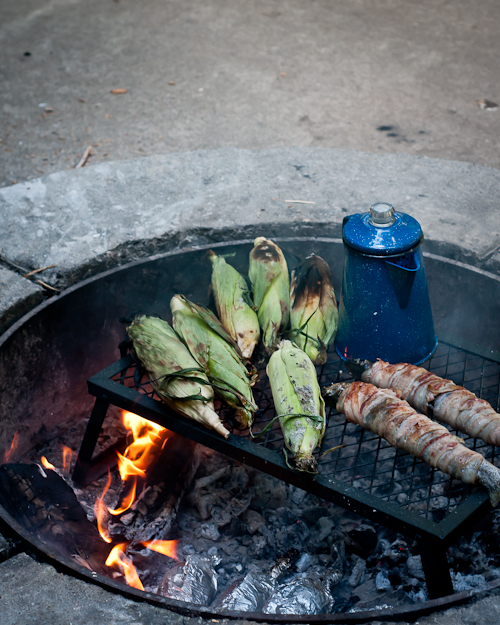 Preparation, as with most things, is key when it comes to campfire cooking. Secret #1: Plan your meals ahead of time. Depending on how long you’ll be camping, this step is very important because it affects how you will store the food. You don’t have to plan elaborate menus — In fact, sometimes simple foods taste the best. I think that’s especially true with camp food. 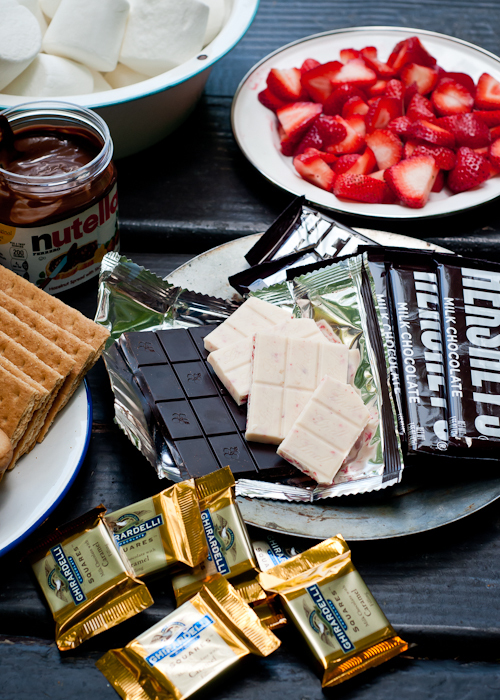 Everything seems to taste great when you’re camping! Plan a little extra food or an extra meal just in case. Also, if you are hoping to rely on foraging in the woods for wild food or catching fish to fry up for dinner, bring a back-up meal for if/when your plans go awry. For us, this an extra loaf of bread, a jar of peanut butter, hot dogs and buns. When camping, I plan on hot cooked breakfasts and dinners. Lunch is a no-cook meal or snacks to get by until a bigger, hot meal at dinner. A cooler is a must. You want one that’s a good size and easy to transport. The ones with wheels are great if you have to walk a bit from the car to the campsite. 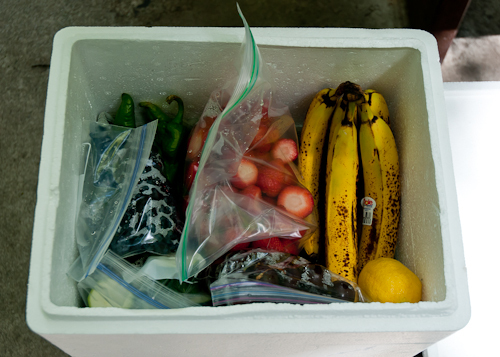 There are a few tricks to packing a cooler to help keep the food at its freshest and coldest for as long as possible. I recently learned a good tip from a friend who is a frequent camper. Secret #2: Line the cooler with cardboard to help it stay cold for longer. The cardboard acts as insulation and allows air to circulate. Secret #3: You’ll also want to pack it as full as possible — a full cooler is a cold cooler. Secret #4: Pack in layers. Start with the last day first and pack the first day last. For example if you’re camping for the weekend, pack Sunday first, Saturday next, and finish with Friday. Place more cardboard or paper bags between each layer and line with ice packs. 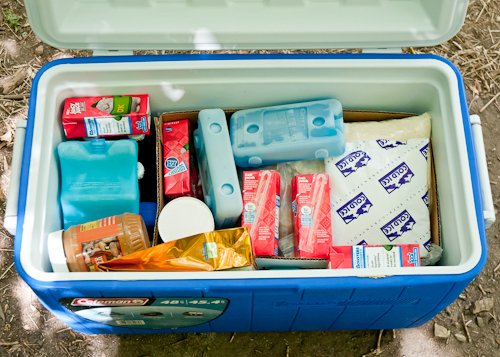 Besides keeping things nice and cold, packing in layers this way will eliminate the need to open the cooler too often. Secret #5: If you need to, bring several small coolers. It’s a good idea to have a separate one for things like ketchup or butter, or other items you’ll need more frequently and won’t spoil if the cooler is opened more often. Fresh fruits and veggies can be stored in a separate cooler that doesn’t need to be kept quite as cold. Secret #6: It’s also a good idea to freeze everything you can the day before you pack the cooler. This includes any meat, cheese, dairy, water, fruit, veggies, etc that will be used in cooking. You can even freeze ketchup or other condiments you’ll be using that require refrigeration. They act as their own ice packs! Bonus: if you are bringing meat or chicken, add marinade and it will marinate as it thaws. Other camping food prep tips: Cut, chop, and marinade food ahead of time. Put things in plastic resealable bags. If you bring pancake mix, measure it ahead of time in the bag and label it — just add water, mix, and cut off the corner and it’s ready to use. Precook stews and chili at home, freeze in plastic bags and it will be super easy to let them thaw and heat up in a pan over the fire. This step will save you loads of time and extra cooking utensils you don’t really need, not to mention clean up! You’ve got your menu planned. You’ve packed your cooler. Secret #7: Next, think about think about pots and pans and other cooking utensils. 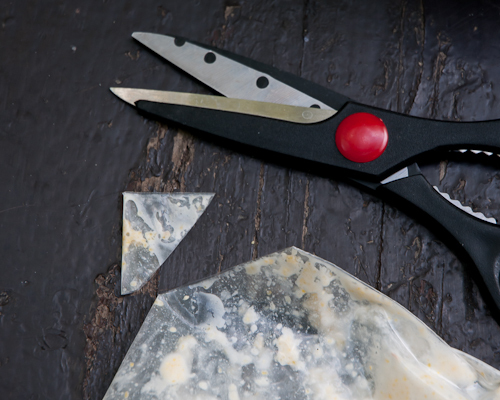 For sure bring a few sharp knives — a chefs knife and paring knife will cover most of your cooking needs at camp. Bring a few cutting boards, sanitizing wipes, or spray. I like to mix liquid dish detergent with water and put it in a spray bottle to keep handy for a quick hand wash or to spray on cooking utensils and surfaces before I rinse and wipe them down. Cast iron skillets and Dutch ovens are great to bring along, but are heavy to carry! Secret #8: Don’t bring your good cookware with you. Purchase some less expensive pots and pans (Goodwill and Salvation Army are great sources for these!) and be prepared that they might get a little beat up. We also bring a percolator to heat water in for hot beverages and washing dishes. Bring a few big bowls for mixing or serving and to use as wash bins. Don’t forget tongs! They are invaluable when cooking outdoors. Bring the longest ones you can find. Be sure they are flame-resistant and don’t have silicone or plastic tips, which can/will melt. Now that we’ve covered the planning part, it’s time to get cooking! Of course, building a fire is a crucial step. Before you camp, read up on fire safety. Make sure it’s safe to build a fire where you are camping. We tend to use campgrounds with dedicated cooking areas that are close to water and other conveniences. If you’re really roughing it and there isn’t a dedicated fire ring, build one using large rocks. Make sure to clear away any loose debris that could catch fire from sparks or ash. Also be sure to build it away from tents and trees. An open space is best. Also, pay attention to weather conditions such as wind or rain. Secret #9: You don’t need a lot of special equipment — firewood, matches or lighter, kindling (you can usually find this at camp), a shovel (for clearing debris, moving logs and coals, extinguishing the fire), loose-fitting high-heat resistant gloves (oven mitts don’t cut it here! ), and last but not least, you’ll probably want some water just in case things get out of hand. If you don’t bring firewood with you, then plan on bringing a hatchet to chop wood. 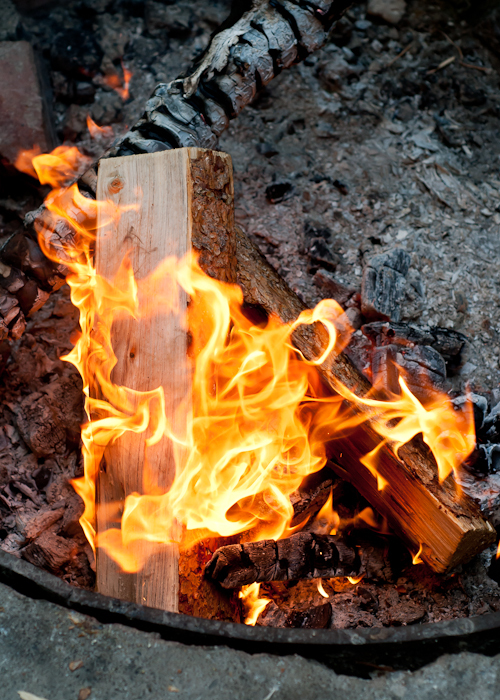 To begin building the fire, you want to use dry hardwood. Secret #10: If you’re planning on finding wood at camp, be sure to stay away from fresh or green wood. It will just smoke and not burn. Look for smaller pieces of dried branches or use paper or cardboard for kindling to help get a small fire going at the beginning. Add larger logs as you go and eventually you’ll have a great fire going. As the logs burn, they will break up and become black with white or gray ash on the surface. This is good. This is what you want! The logs have turned into coals. More on that next! Secret #12: Contrary to what you might think, you don’t really want to cook over an open flame. The heat is not consistent and there’s a higher chance of burning the outside of your food before the inside is cooked thoroughly. The marshmallows above were cooked over an open flame. They promptly caught fire, turned black and the inside remained cold. This also happens with hot dogs and other foods you cook on long sticks over a fire. You want the glowing embers, not the flames. The goal then is to get the firewood to burn down into white hot coals. 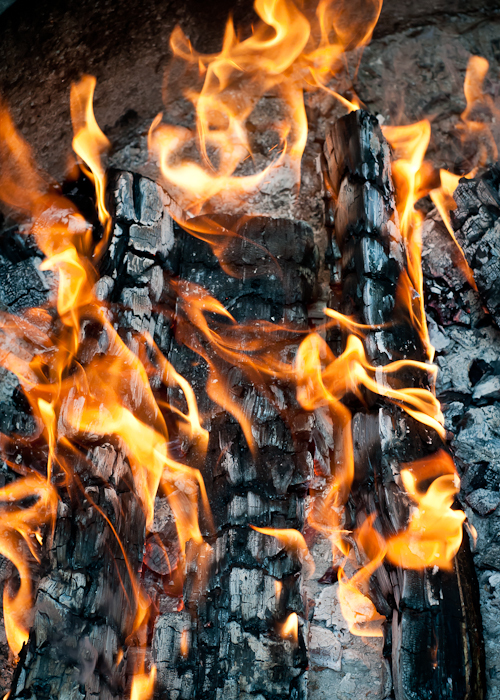 The coals provide a heat as hot or even hotter than the fire, but one that is much more even and consistent. To isolate the coals, move the larger pieces of wood aside and use a long handled spoon or shovel to rake the coals where you want them. You can keep adding more kindling to the main fire as it dies down. 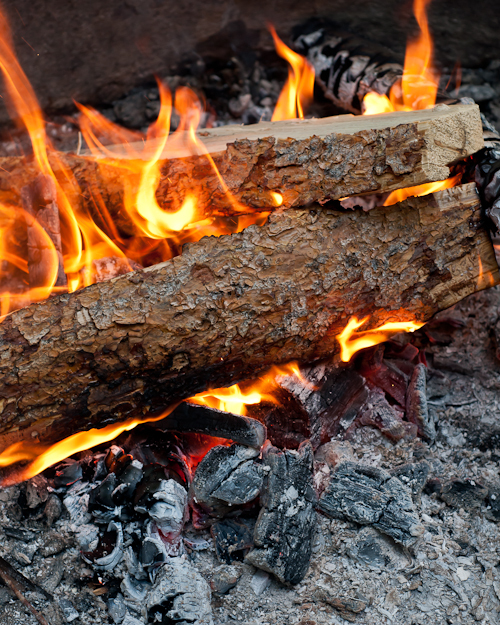 The logs will keep turning into fabulous, super-hot coals. You can break up the logs with a shovel to create smaller coals if you need to. 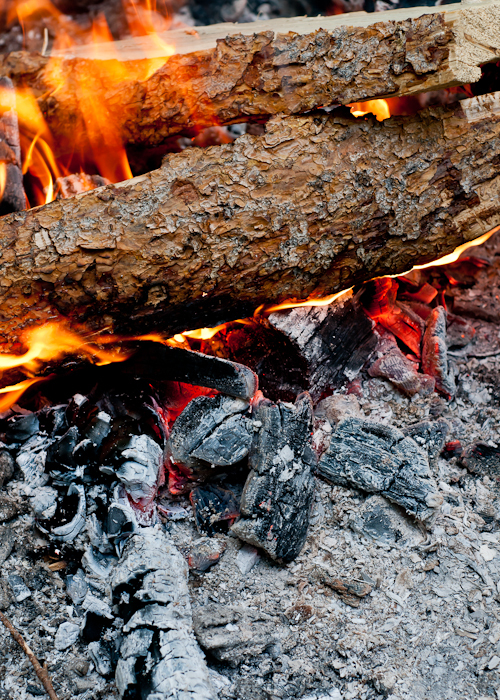 Secret #13: We like to create the fire on one side and leave room for the coals on the other. The reason for this is that it’s nice to have a dedicated area just for cooking, and the other side is for creating hot coals and provides warmth. Secret #14: Campfire grills are inexpensive and lightweight. They are worth the investment. It really comes in handy when you don’t want to cook directly on the coals, or if you don’t want to buy or carry a camping stove along. The flat surface is great for pots, pans and percolators or as a direct cooking surface for food. 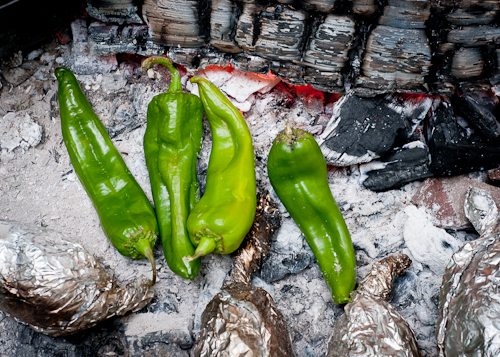 Secret #15: There are times when you’ll want to cook directly on the hot coals. We mostly use this method for cooking things like vegetables, particularly root vegetables, or when we use a Dutch oven, or for foil dinner packets. (More on Dutch ovens to come too!) 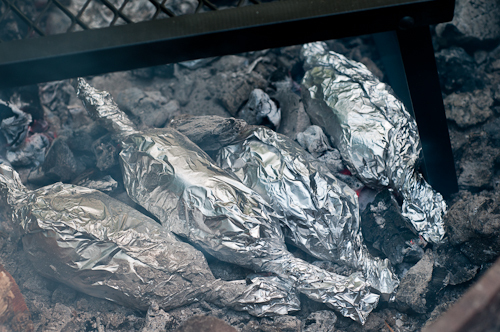 The coals are very, very hot, so you will need to protect the food a bit more by giving it a double wrap in heavy-duty aluminum foil. Or if it’s something like corn, cook it in the husk and it will be protected from the high heat. 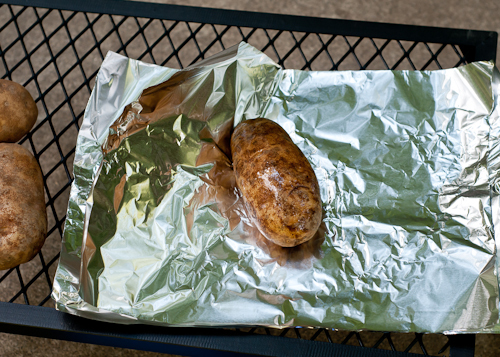 Secret #16: With foil dinners, it’s a good idea to layer the food in such a way as to prevent it from burning. I’ve seen campers say they line the bottom of the packet with cabbage leaves or thick slices of onion, then layer root vegetables, protein (meat, chicken, fish, etc.) with aromatics (herbs, leeks, garlic, etc.) on top and a bit of liquid (stock, wine, water) to keep it from drying out. Cut the vegetables in smaller pieces because they will cook more quickly and the meat in larger pieces so they take a bit longer and will be done at the same time as the vegetables. You can leave potatoes whole or cut them in half. Whole potatoes and other vegetables take a bit longer to cook than those that have been cut in half, sliced, or diced. For whole potatoes, rub them with a little bit of oil and prick a few times with a knife or fork. Then wrap them up! When you wrap the food in foil, place it in the center and seal it tightly by bringing the edges together in the center and rolling or folding tightly. Secret #17: Don’t forget to create some handles on the sides. The food will be very hot and it’s much easier to grab the handles and there’s less of a chance of tearing open the foil packet and getting ash on the food inside. Place the food directly on the coals and use a long-handled metal spoon or shovel to bring some of the coals up and around the foil packets. 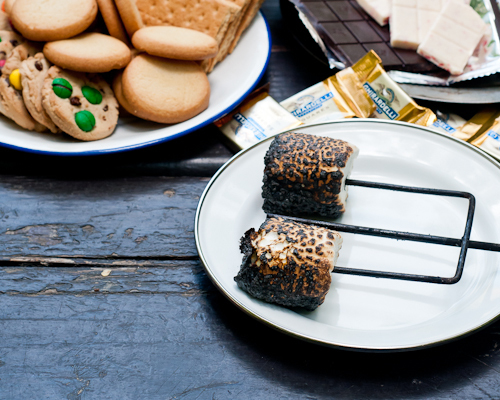 Secret #18: You can even wrap s’mores in foil and toss them onto the coals or grill for a few minutes. It works great and it a little less messy than the traditional method. 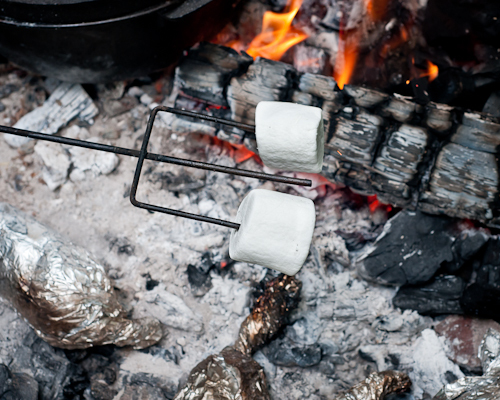 Secret #19: Some foods can be cooked directly on the coals and ash with no tin-foil needed. Peppers and chiles are great cooked like this. The peels blister and pop and the get great flavor from the fire and smoke. As I mentioned, corn-on-the-cob can be cooked directly on the coals because it is protected by the husk, but you can also wrap it in foil if you’re worried about it burning. 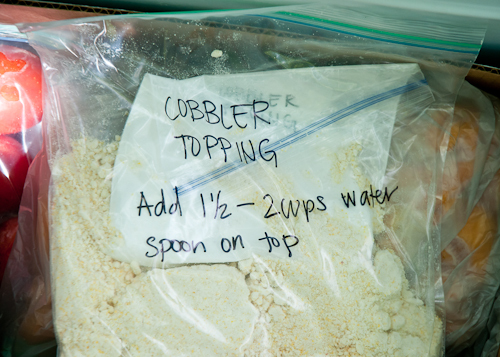 Secret #20: Soaking cobs in cool water for 30-60 minutes will also keep the husk from burning. We also cook corn on top of the grill. Either way works great. 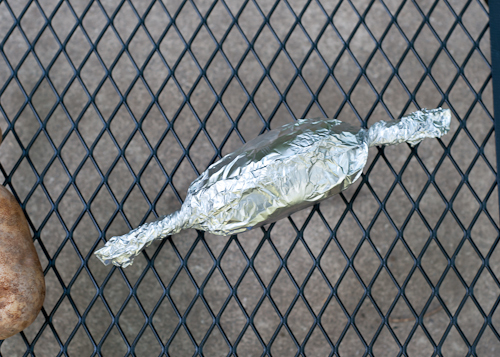 Secret #21: Typically we’ll cook meat, chicken and fish on the grill unless we’ve wrapped it in foil. It takes on a great flavor being cooked over the coals with the nearby flame. Secret #22: An important step is to turn your food every 15-20 minutes so it cooks evenly. 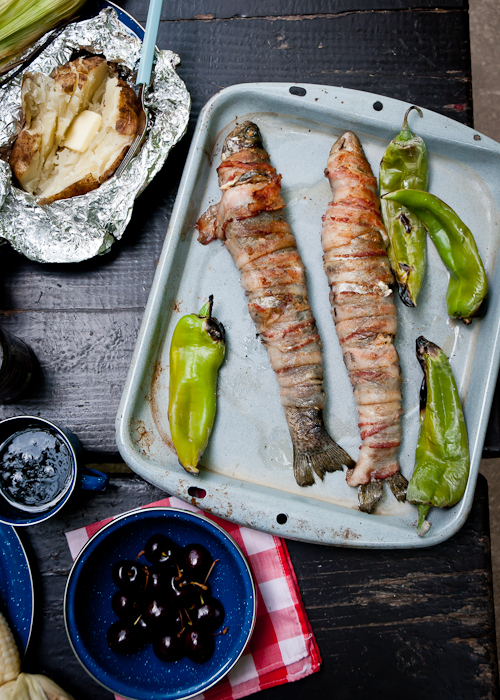 The bacon-wrapped trout pictured above needs to be turned frequently to avoid flareups from the dripping fat. Secret #23: Also, remember that the food will be very hot and retain heat for awhile after it comes off the fire. Corn will finish steaming in its husk. Potatoes will cook a bit more in their foil packets. Things cooked on top of the grill will need to be covered with foil after cooking to help them stay warm — the cooking temperature is a little cooler than directly on the coals. 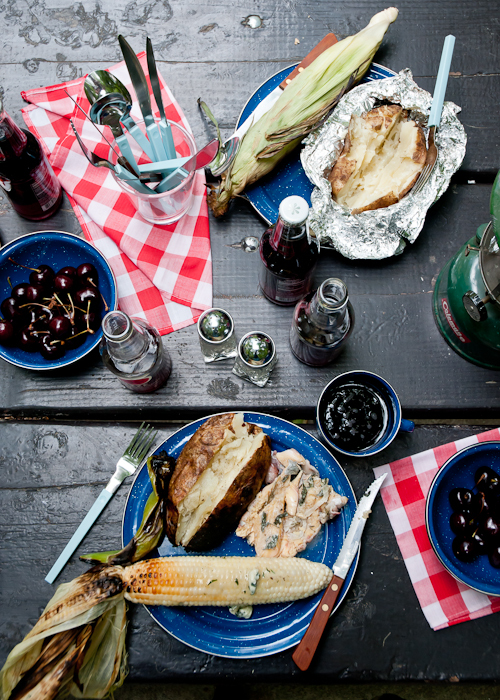 I’ve come up with a fun menu that takes camp food up a notch without being too complicated. It relies on fresh food made flavorful by the fire. 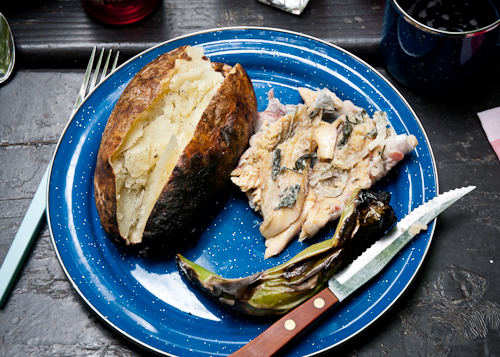 If you aren’t a fan of fish, you could easily substitute boneless, skinless chicken breast or thighs for the trout. I’m not usually a fan of trout, but cooked this way it’s amazing! For dessert, I included the ubiquitous s’mores. So many variations, so little time! 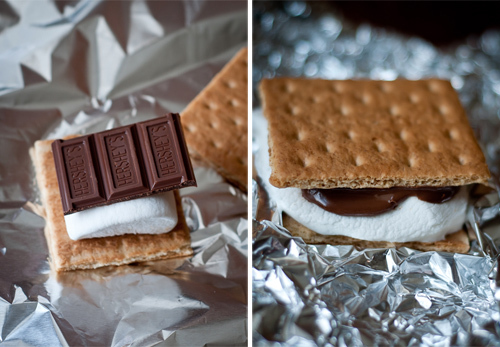 Check below for some suggestions on making your s’mores extra fancy and delicious. Rinse and pat the fish dry. Sprinkle the inside of each fish with salt, pepper and garlic powder. Lay a few sprigs of rosemary and sage and thinly sliced onion inside. Close the fish. Starting at the tail begin wrapping the bacon all the way around. Tuck the end of the bacon strip under itself before continuing with a new slice. Wrap an extra piece around the head to help keep it secure. If not cooking immediately, wrap the fish tightly in freezer paper, parchment or plastic wrap and keep chilled for up to 6-8 hours. Prepare a camp grill over hot coals. Place the fish on the grill directly over the coals. Let cook for 10-15 minutes, then carefully flip over and cook on the other side for and additional 10-15 minutes or until the bacon is crispy on all sides. The actual cooking time may vary a little depending on the size of the fish and the temperature of the coals. Check to see if the fish is done by poking with the tip of a knife. It should pierce it easily. If not, flip again and cook for another 5-10 minutes. Remove from the heat and serve immediately. Makes 4-6 good-sized servings. *Butterflying the fish is optional, but worth the extra time to remove most of the bones. If you have purchased the fish, ask your fishmonger to do it for you. You need to have a very sharp knife if you do it yourself or you’ll damage the fish in the process. Scrub the potatoes really well. Dry and the rub with a little oil. Wrap each potato in a double layer of foil, twisting the ends to use as handles. Separate the hot coals from the main part of the fire. Place the potatoes directly on the hot coals. You can use a shovel or long spoon to scoop the coals and ash around the potatoes. Let cook for about 45 minutes. To test if they are ready, gently squeeze the potato. If it gives, then it’s ready. If it’s still hard, then put back onto the coals for another 10-15 minutes and test again. Rotate the potatoes every 20 minutes for even cooking. Note: Prepare a few extra potatoes for the next day. In the morning, dice the potatoes and fry in a pan for quick hashbrowns. If desired, gently pull back the husks without tearing them and remove just the silk. Pull the husk back over the corn and secure with twine. Or leave the silk on and it will come away easily after the corn has been cooked. Soak the corn in cool water for about an hour before cooking. This will help prevent the husk from catching fire. Separate the coals from the main fire. Place the corn directly on the flames. Cook for 10 minutes, turn, cook for 10 more minutes. Test for doneness. If not done, place back on coals for another 5-10 minutes. *Be careful! Make sure to wear protective gloves or a hot pad because the ears will be hot and let off steam as you open them. Time to get creative by mixing and matching different kinds of cookies, chocolate, spreads and other goodies! Graham crackers, chocolate chip cookies, oatmeal cookies, snickerdoodles, chocolate wafers, shortbread, gingersnaps, etc. sliced strawberries, bananas, pineapple, raspberries, etc. Skewer marshmallows on roasting stick of choice. Hold over hot coals. Rotate frequently for even cooking. Marshmallow is done when it becomes loose on the stick (meaning it’s melted inside) and golden brown on the outside. 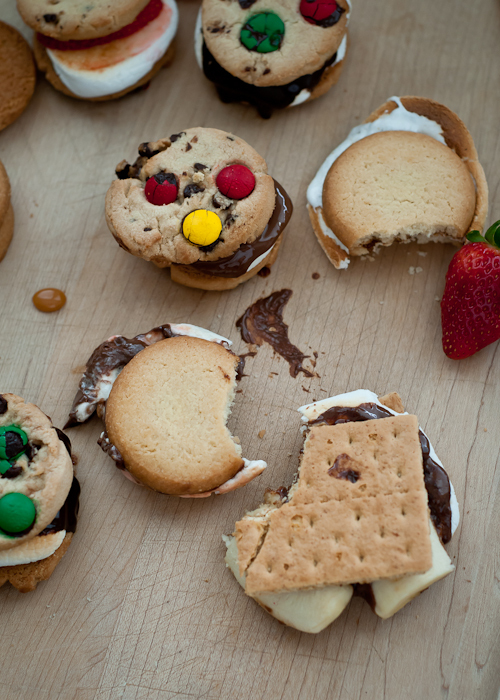 Sandwich the marshmallow between two cookies/crackers along with chocolate, fruit, or spreads of choice. Eat while warm. Now I want to hear from you! 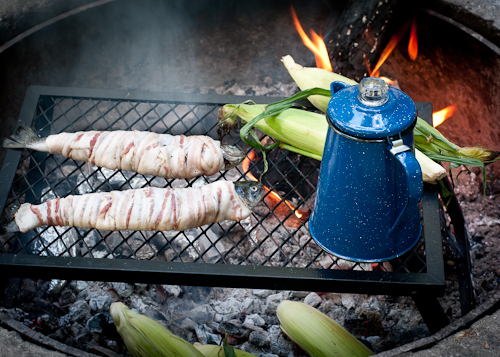 What are your favorite, must-have camping foods? Any secrets to cooking on a campfire that I forgot to add in? And will you be doing any campfire cooking before the summer ends? P.S. — Like secrets? Find all the posts in the Secrets to Living Well series here. Someone is an amazing cook! That looks very impressive. These images make me rethink the idea of car camping! We usually just backpack in and rough it for a few days. Holy smokes this is an amazing post! Thank you so much for sharing. AMAZING! Wonderful tips, some I knew, but others were new to me. Thank you! I’m not really a camper, but this just makes me want to go! You are awesome, thank you for this! Great post! This will be an excellent resource for my family. Thanks! Such a fabulous post, thanks for sharing! These tips are great. I would like to add on how to get a great coal base to cook over. The bigger the piece of wood is, the longer it takes to burn. So to get a good coal base quickly use only kindling. It burns hot and fast. Build up 2 or 3 towers of kindling, and you are ready to cook in not too much time. Again, I love this tips! I love this post! We were en route to our very first family camping trip when I saw it. So excited to already have menu ideas and cooking tips for our next camping adventure. Looking forward to more posts on this subject. Thanks for sharing your knowledge! 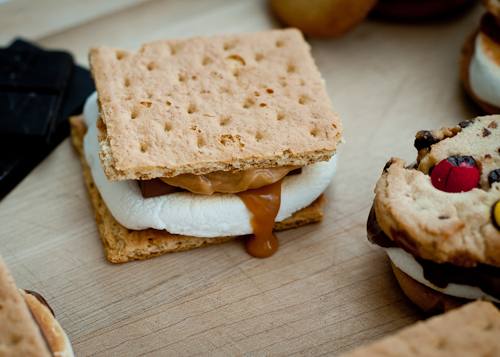 I never thought of using different cookies for s’mores! Yum! You are a girl after my own heart. I love camping! Unfortunately this year we weren’t able to camp when the weather was good because we had work being done at our home but we have had s’mores on several occasions over a fire pit. My new favorite is using a peanut butter cup instead of chocolate bar. Yumm! I love cooking on a fire. Food tastes best and it’s fun! Your post (and pics) are great. Almost done building a home in Puerto Rico, and we’re building a Firebit in the backyard (a must have), Everythings almost done because I have famly coming in December for Christmas staying thru New Years and that Firepit is going to get its usage during that time. Oh what fun. Thanks for the ideas. I have invented a campfire grill that is very portable, light weight and really fun to use. Please check out my website, (brand new and under construction), and email me with any comments or questions. THIS IS PERFECT! You saved my life! Best post I’ve read so far! Seriously, thank you so much! Very detailed. Wow! My friends and I are going on a camping/backpacking trip for the first time in my life – your post was extremely helpful to help me prepare for this cooking adventure. It’s very motivating as first timer to have your knowledge + experience! These are great tips! I am a seasoned camper, but I learned a few things here today. Thanks! Great tip about lining the cooler with cardboard. Never thought of that. be doing the cooking. I did some catering for a few years. I was pretty good. to see I still got it.